Two great streets dominate this area – the Avenue des Champs Elysées and the Rue Saint Honoré. The former is the capital’s most famous avenue. Its breadth is spectacular. The pavements are wide and cafés, cinemas and shops attract throngs of people, who come to eat and shop, but also to see and to be seen. Rond-Point des Champs Elysées is the pretty end with shady chestnut trees and pavements colourfully bordered by flower beds. Luxury and political power are nearby. Five-star hotels, fine restaurants and upmarket shops line the nearby streets and avenues. Situated along Rue du Faubourgh St-Honoré, the impressive, heavily guarded Palais de l’Elysée, sumptuous town mansions of business chiefs and many embassies and consulates. Located not far from Champs Elysees, the Chaillot village was absorbed into Paris in the 19th century and transformed into an area rich in Second Empire avenues and larges mansions. Some of the avenues converge on the Place du Trocadero, renowned for its elegant cafes. Nearby, the Avenue du President Wilson, that has a greater concentration of museums than any other street in Paris. Many of the area’s private mansions are occupied by embassies and by major company headquarters. 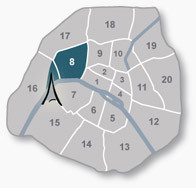 To the west is the territory of the ‘haute bourgeoisie’, one of Paris’s most exclusive residential neighbourhoods.